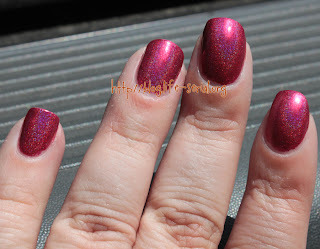 The one with Franken Friday - I'm Not Really A Holo Lover! Hello Friday!! I'm super excited because it's my son's last day of school! I'm sure he's more excited that I am! I promised him I would make him a special dinner tonight, his choice. Of course, he chose spaghetti. :) So today is such a bittersweet day for me. I love that he's growing up, but I hate it at the same time. I always ask him if he would just slow down on the growing up, and he always tells me he can't. ...but I'd better feature a polish today huh? 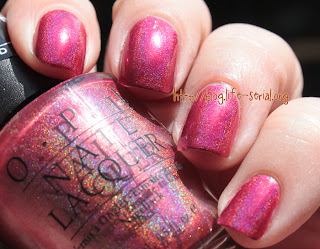 It being Franken Friday, I'm showcasing a creation from Laurie over at Dressed up Digits! She knows how much I love OPI I'm Not Really A Waitress, cause she's loves it too! She decided to make it holo-fied for me! 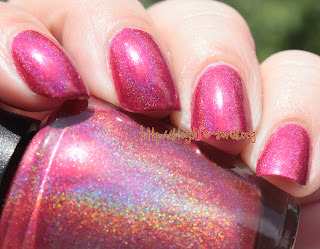 She didn't name it before she sent it to me...but as we were brainstorming, the perfect name emerged - I'm Not Really A Holo Lover! 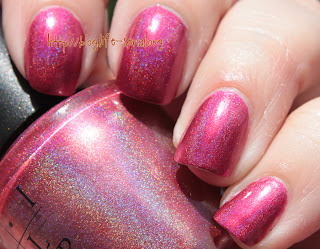 ...cause didja know that I'm not into holos? Look at that holo-ness! Laurie did good, didn't she? :) I really like it! 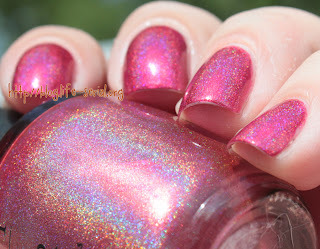 Not being a holo person, I can do subtle, sweet looking holo - and this is definitely sweet!